This page describes the history of the urbanization in Israel. Examples are given, and mapped to the sites that are featured in BibleWalks.com. This page describes the history of the urbanization in Israel, starting from the caves, up to the modern cities. Examples are given for each of the stages, and are mapped to sites that are featured in BibleWalks.com. At the last section an example is given of a typical Israeli scene, where all the stages are combined together in a small area. 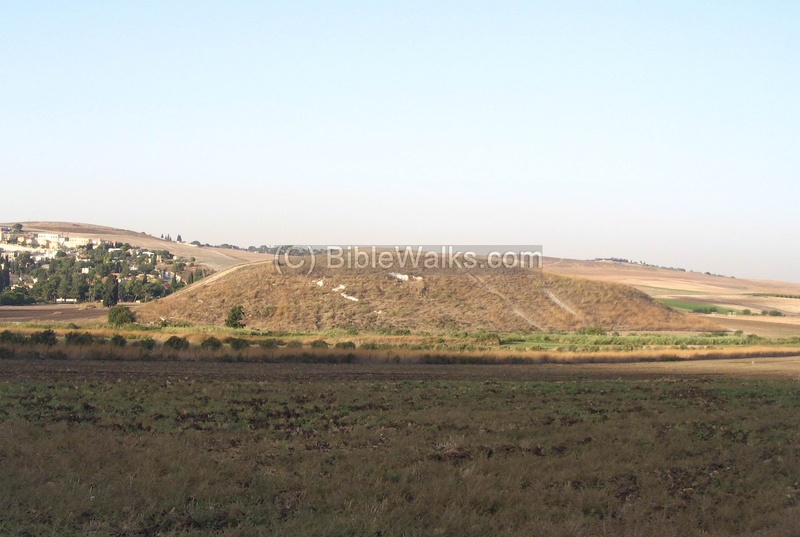 These stages are detailed below, and mapped to the sites that are featured in BibleWalks.com. The early man used the shelter and protection of the natural caves as their first homes. In Israel there are many such sites, especially in the hills along the shore, on Mount Carmel , in the hills of the Galilee and the sea of Galilee. The excavations in the Carmel region showed that the early man has been in this area over the last 150,000 years. 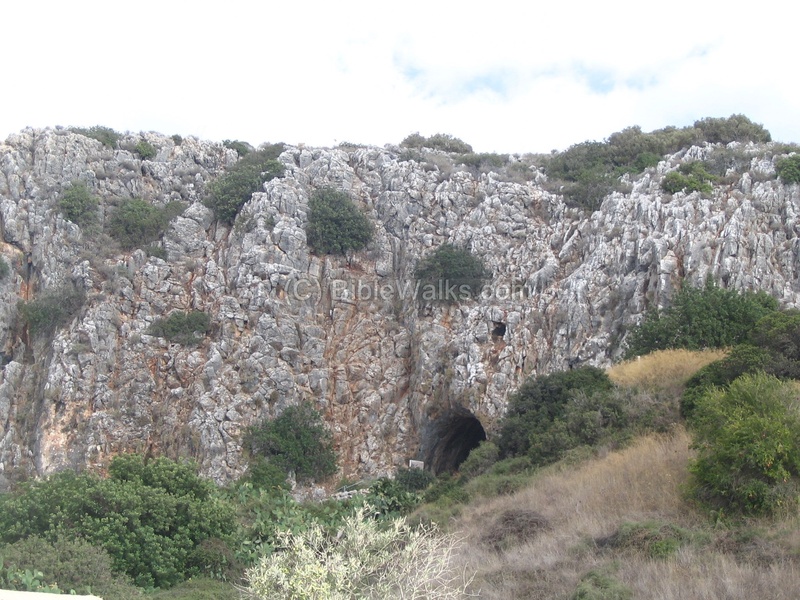 Biblewalks.com sites: Carmel caves (photo seen below), Oren caves. Due to the increase of the population, and the change of occupation, there was a need to expand the area of dwelling beyond the short distance from the caves. The agriculture started at about 8,300BC - the start of the Neolithic period. Thus, the caves were abandoned, and along the rivers and near the springs the early man built temporary and seasonal housing, and later established farms. Examples in BibleWalks: Nahal Zippori, seen below. This stage marks the real advance in the "civilization". At about 7,500BC Man started to master the art of ceramics which enhanced the level of the tools. Additionally the art of building structures has started as a collection of natural stones, and improved to cutting and fitting stones into larger structures. During the Neolithic period the villages started to emerge as larger cities, such as Jericho, one of the first cities. 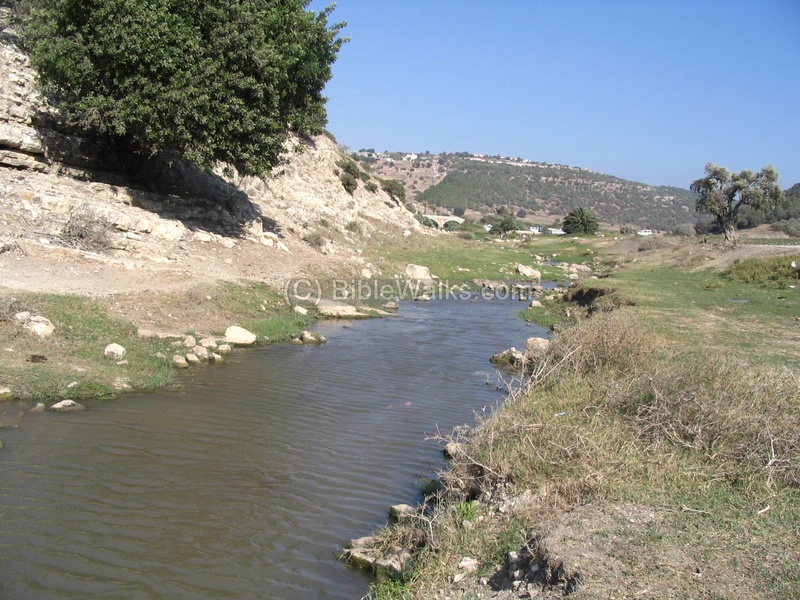 Jericho was established as a fortified city at about 7,000BC. During the Calcholitic period (5th C BC ) this pattern spread in the whole region, and new cultures emerged in Mesopotamia, Egypt and Syria/Israel. The major early cities were in Israel were Jericho, Megiddo , Beer-Sheba, Yarmuk. The cities grew bigger and increased to dozens of fortified cities in different sizes during the Bronze age (starting at 3150BC). These sites, now Tells (mound), were protected by high defensive walls, gates, and were usually located on the ancient trade roads. The stronger cities conquered nearby cities, and later other countries, and eventually emerged as empires. 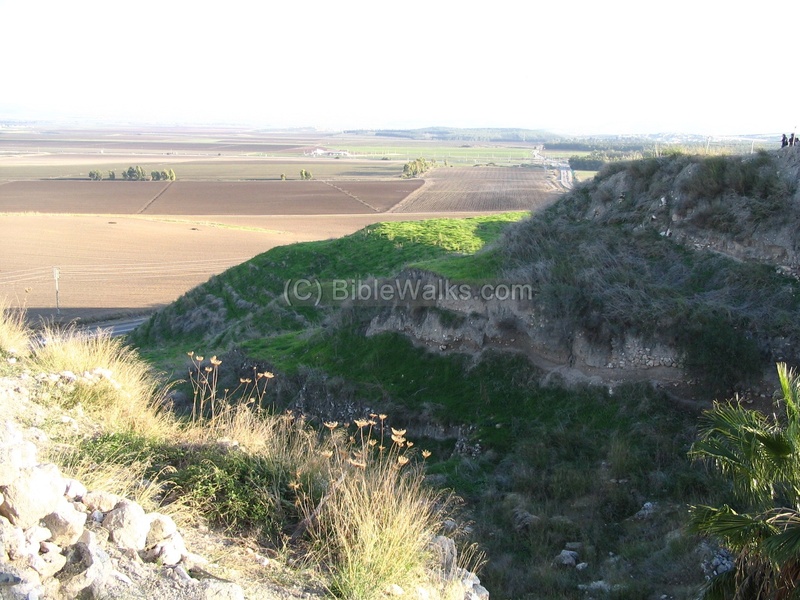 Examples in BibleWalks: Megiddo, Hazor, and more (see: history of the Tell). In the 3rd C BC, at the beginning of the Hellenistic period, the Tells were abandoned and new modern larger cities were established. These cities had planned designs, installed water systems for larger populations, and grew in size to accommodate the increasing population. The number of cities and villages sites grew to hundreds in the Roman period in the Galilee area alone. 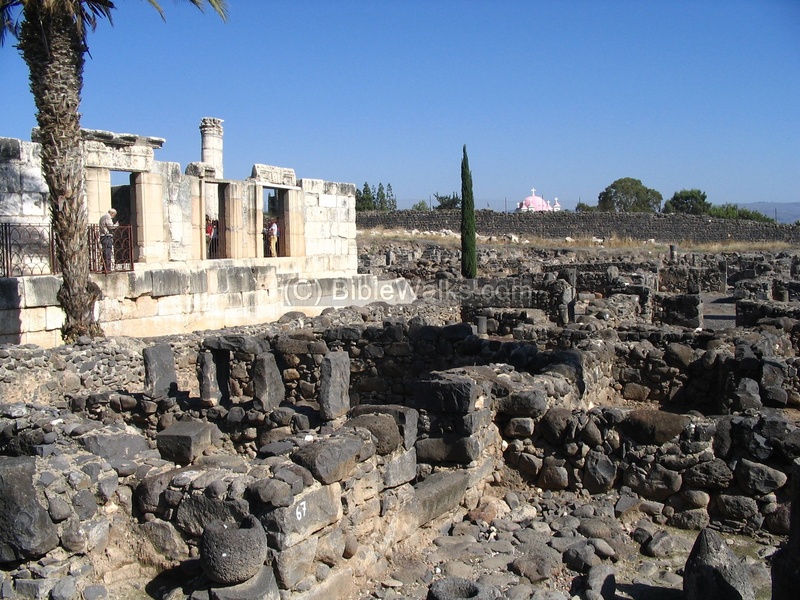 Examples in BibleWalks.com: Capernaum (seen below). See all sites in the overview page. Stage 1: Caves - In the prehistoric periods the area south-east to the Tell Kinneret, located on the edge of the Amud creek, was populated starting in the Early Paleolithic period (150,000 to 80,000BC). Fragments of skeletons were found in the Amira cave and other caves along that creek, about 2KM from the Tell. Stage 2: Seasonal sites, farms, villages - the area around the lake was inhabited with fishermen villages, including the shores of the valley (Gennesareth). For example, Capernaum first started to be inhabited during the 3rd Millennium BC in the early Bronze period. It was a small village of several houses, which was in the area controlled by the Biblical city in Tell Kinneret. 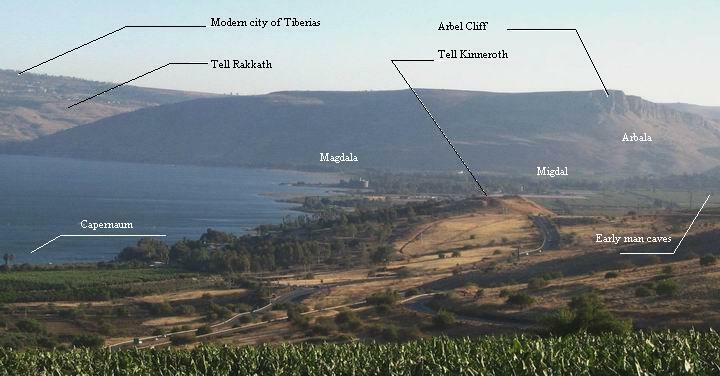 Stage 3: Fortified cities (Tells) - in the area there are two major cities: Tell Kinneret and Tell Rakkath. Stage 4: Planned towns - in this area there are several new towns from the Hellenistic and Roman/Byzantine period: Tiberias, Capernaum, Arbel Cliffs and Arbala, and Magdala. Most of these sites were planned in advance and had many public structures and roads. Stage 5: Modern towns and cities - In this photo there are several modern places: a town (Migdal), a Kibbutz (Gennosar), and a city (Tiberias).